EPHRAIM — Two pillars, each adorned with a wreath and a candle, had set the stage for Ephraim Middle School’s annual Candlelight Service, a ceremony to honor two members of the community. 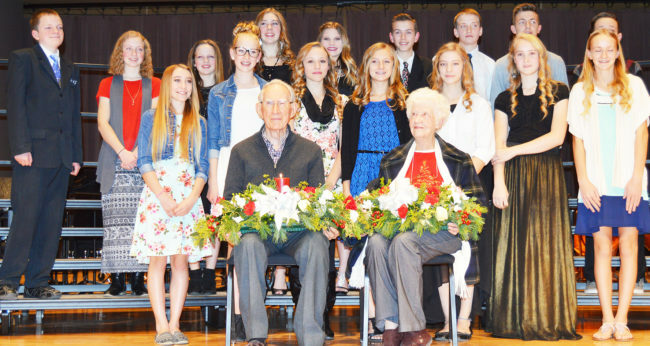 The concert at the Eccles Center drew a full house on Wednesday, Dec. 7, to honor Marge Anderson of Ephraim, and Vern Buchanan of Manti with the wreaths and lighted candles, an honor reserved for model citizens. This year, 16 eighth-grade honor students were selected to light the candles — which sat in the center of evergreen wreaths — and present them to the two recipients. Buchanan, the first recipient of the Candlelight award, is a retired carpenter and general contractor, and can be considered a savior of local historic architecture. “Vern Buchanan has served the citizens of Manti over the years in many, many ways,” Tim Miller, Ephraim Middle School (EMS) principal, said. Buchanan moved to Manti from Salt Lake in 1990. One day, while on a walk down Main Street he stopped to read a plaque on the Old Manti City Building and saw the name of his great-grandfather, John Buchanan, listed as one of the four carpenters who helped construct the building. The building had been vacant for several years and had become dilapidated, yet the city was obligated to continue paying the insurance and utility bills. Because the city could not afford to restore the building, the council considered tearing it down as a last resort. But that’s when Buchanan intervened, and with a group of volunteers, he began the process of restoring the beautiful building his great-grandfather helped build. “Grandpa John will come back and haunt me if I don’t save this building,” he said. After he evaluated the building, he said he believed most of the restoration work was cosmetic. The first action he took was consulting a state historic architect, a local building inspector and a local contractor, who all agreed with his evaluation. He met with the city council and had proposed a detailed plan outlining costs of restoration. He also had proposed ideas of how the building could become an asset to the city instead of a liability. The city accepted his proposal and even gave him $10,000 seed money to start the restoration, which began in 2002. Buchanan said he spend well over 4,500 volunteer hours to bring the building back to life, and with the help of government grants and public donations, the interior was restored in 2005. The building now houses the Sanpete County economic development office, a state tourist bureau and a small museum that sits on the second floor. Buchanan even built the picnic tables and benches that sit in the small park south of the building. Ephraim resident Marge Anderson, who many have claimed holds an unwavering love for all people and her community, was the second recipient of the Candlelight award. People say that she lives each day quietly going about serving others. She said it’s because her family and friends are important to her. Anderson served on the Ephraim Beautification Committee and helping to set a county standard for city beautification. Barbara Davies, an Ephraim City employee, said Anderson did an excellent job to help revitalize and update various city properties, along with the starting the beautification project on Main Street. Snow College and Ephraim City have also benefitted from Anderson’s devoted community service through her fundraising efforts to create a new park. Through the course of her life, she has served in many callings in the LDS church, including primary on both a ward and stake level, Relief Society and Cub Scouts. In recent years, she has sung in her ward choir. Anderson is dedicated to her five children and volunteered in their schools and also participated in all of their extracurricular activities. At one time, she was even the official scorekeeper for her children’s various teams. When her husband, Phillip Anderson, decided to go to college to become a pharmacist, Anderson took on the responsibility of being the bread-winner for her family. She said she had a lot of free time after her husband transferred from Snow College to the University of Utah. It was then that she allowed her love of sewing and quilting to blossom. She and her friends had begun a quilting group and made several remarkable quilts, many of them donated to the Festival of Trees and to the Cancer Society in support people in need. 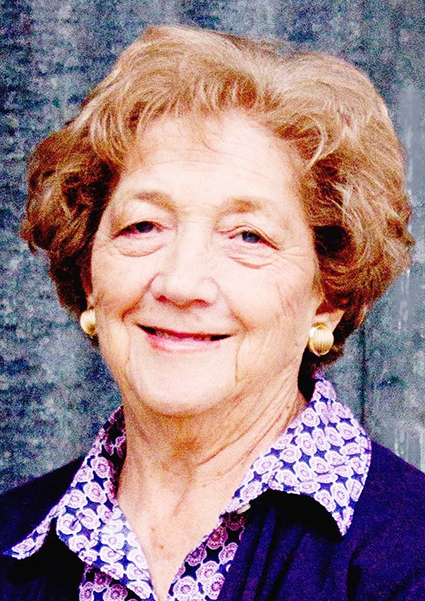 Over the years she has continued the spirit of giving, and is said to have a strong work ethic, which is exemplified in her service to Anderson Floral and Drug, where she is employed full-time as cashier, florist and Utah’s oldest licensed pharmacy technician. Anderson is said to be a staple in the pharmacy with her endless wit and concern for the customers she serves. 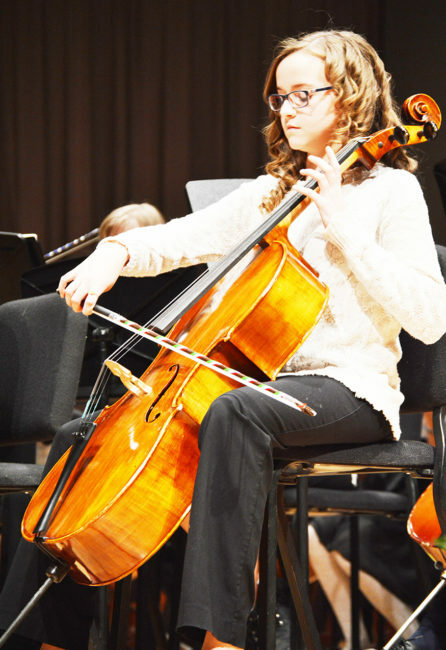 The evening of honoring the two recipients began with Christmas performances by the seventh- and eighth-grade orchestra and choir. Raul (left) and Irma Almanza have lived at DJ Trailer Court for 17 years. Raul is on dialysis. Their daughter, Brenda (right), who completed three semesters at Snow College, has a new baby and no longer lives with her parents, but was at a meeting Saturday night to support them. 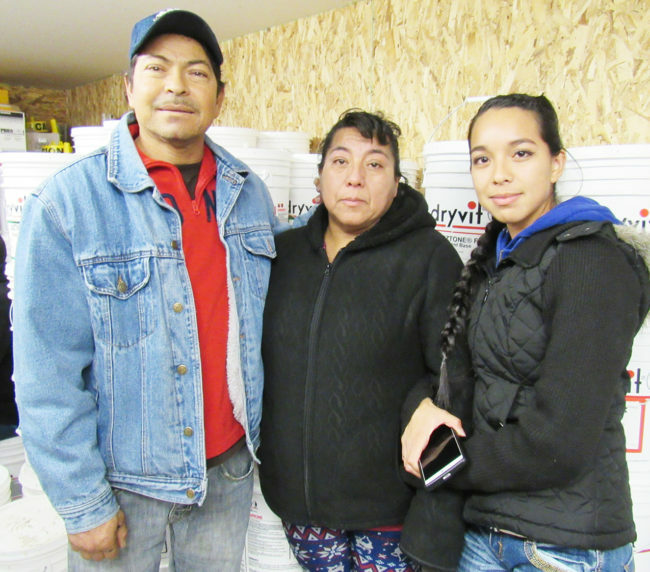 EPHRAIM—There was one overriding question among the 13 adults, all Hispanic, who gathered in a contractor’s storage garage outside Ephraim Saturday night to discuss the predicament of the DJ Trailer Court. “Where are we going to go?” multiple residents asked out loud. Living in the DJ trailer court is not necessarily a choice, said Brenda Almanza, the adult daughter of a couple who have lived in the court for 17 years. “They’re there because that’s what they can afford. If they could move, they would,” she said. In late November, the 17 households in the park received a letter from the Ephraim City telling them the city had tried to convince David Strate, the owner of the trailer court, to make improvements to protect residents’ health and safety. Since Strate hadn’t made the repairs, the letter said, utilities would be shut off, and all residents would be required to vacate by Jan. 31. Maria Palmerin Orozco, a second-generation Hispanic woman who owns a mobile home in the park, who works as a dental assistant, and who helped translate for a Messenger reporter during the meeting, said all of the Hispanic families in the park have friends and family in Sanpete County. If required to vacate, they “won’t be on the street,” she said. If they have no other choice, they could stay with friends or family for a time. “But we want our own homes,” Irma Almanza, Brenda’s mother, said. Irma appeared to be one of the most frightened people at the meeting. Her eyes welled with tears as she explained her husband, Raul, is on dialysis. He drives to Provo twice a week for treatments. Her check from Norbest pays for housing, utilities and other necessities. Yet their daughter, Brenda, who was born in Mexico but grew up in the DJ court in Ephraim, is doing well. She graduated early from Manti High School and went to Snow College at Richfield for three semesters. She now has a legal social security card. She doesn’t live at home anymore, and with a new baby, has limited ability to help her parents. No one at the meeting disputed the city’s contention that water, sewer and electrical systems at the park are in poor condition. Nearly all the units at the park are pre-1976 and consequently do not meet current federal, state and local standards for manufactured housing. But, one resident said, many families have remodeled the interiors of their homes. He recently put $7,000 into his. “It’s old, but if you go inside, it’s very livable,” he said. Lianne Hirst, a paraeducator at Ephraim Elementary School who acts as the school’s liaison with Hispanic families and who served two LDS missions in Latin America, has been acting as an informal advocate for the families. She was at the meeting Saturday night. Based on questions and a show of hands, she said that of 17 households currently in the park, 14 are Hispanic and three Anglo. Family members in 12 of the 14 Hispanic households work at Norbest. Virtually all of the Hispanic families are undocumented. Stress is coming at the families from two directions, Hirst noted. Several residents have been told that because they don’t have legal social security cards, their jobs at the turkey plant could end Dec. 31. Orozco said the same thing has happened before. “They give them a date, and when the date comes, they give them a later date,” she said. Nonetheless, the families face uncertainty. “The timing is awful,” she added. “If Dave doesn’t fix the court and the city kicks (the residents) out, they just want until May or June so they can get everything out,” Orozco said. Much of the meeting centered on Strate, what he has and hasn’t done, and whether residents might be able to help fix up the trailer park. Orozco took issue with Strate’s contention at the city council meeting that he hadn’t understood what an inspection report prepared by Sunrise Engineering, the city’s contracted building inspection and code enforcement firm, was asking him to do. “Here I am, with no construction background, and I understand,” she said. She said residents were willing to clean up trash at the park, remove non-working vehicles, and even remove wooden porches and rooms illegally added onto trailers. “We can offer to help…We can ask David what we need to do,” one resident said. “David could do it (make repairs). He has the money,” one resident said. Such as? Orozco said she would get a lawyer to represent her. Other residents said they would start to move. Several residents at the meeting claimed that although the city generates a separate utility bill for each unit, all the bills go to Strate. The city confirmed that all utilities at the trailer court are in Strate’s name. The residents said Strate marks up the bills and then collects more for utilities than the residents actually owe. Ephraim officials said such a practice could be a criminal offense. “He has a right to the rent,” one woman said, but not to overcharge for utilities. “He is,” Orozco said emphatically. On the positive side, residents said when they don’t have enough for rent, Strate gives them extensions. They fear other landlords would not be as lenient. One question the residents asked repeatedly was who would compensate residents for loss of their trailers and for relocation costs. “If the city is the one kicking us out, the city should pay us for our house,” one resident said. Residents were also asked if they would support a plan, now being discussed, under which a nonprofit organization would purchase the park property from Strate (if he was willing to sell), redevelop it, reposition existing units in a reconfigured park, and then turn ownership over to an association of residents. Possibly, everyone would need to move out while work was underway. 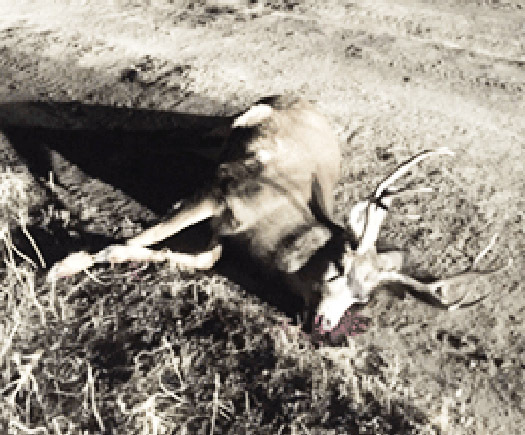 This four-point buck deer was illegally shot and killed near Moroni last week. Investigators are currently looking for the poachers. MORONI — Utah conservation officers are on the prowl for poachers, including some who illegally killed a four-point buck deer near Moroni last week. The Division of Wildlife Resources (DWR) released a statement about the Moroni poaching incident last week. According to investigators, a concerned citizen contacted Utah DWR Sergeant Matt Briggs about witnessing a four-point buck deer being shot and left near Moroni. The witness approached the poaching suspects, but the suspects fled in a side-by-side toward the Blue Hills Road. Conservation officers determined that the deer was shot in a nearby field before it died on the road between Pea Valley and Blue Hills Road. It had been shot multiple times, according to the DWR statement. The responding officers were unable to locate the suspects, but the witness described them as driving a multi-colored side-by-side, possibly a blue and white RZR, with an 18- to 24-inch light bar above the driver’s head. According to investigators, shortly before the deer was killed, someone saw the side-by-side being driven through Pea Valley. Investigators believe the suspects are from the Moroni or North Sanpete area. With the winter season in full effect, efforts to prevent poaching incidents like this one are being ramped up. Conservation officers with the DWR will be focusing most of their law enforcement efforts in areas where deer congregate in the winter. They have one goal in mind: protect Utah’s deer from poachers. DWR Captain Mitch Lane said that in the winter, deer congregate on ranges at lower elevations. As large groups of deer bunch together, they provide poachers with an enticing target. But the deers’ behavior helps wildlife officers too: it directs them to areas where poaching will most likely happen. Lane encourages residents to get involved too. Lane said patrol efforts are underway on winter ranges across Utah. The patrols will continue until the deer shed their antlers this spring. According to Lane, so far in 2016, wildlife officers have documented the illegal killing of 250 mule deer in Utah. Most of the deer were bucks. The antlers on 10 of the bucks were big enough to place the deer in a trophy category. He said the monetary value of the poached deer to Utah’s citizens is $176,000. If you have information about the killing of the deer in Moroni — or about any other wildlife violation — follow Lane’s suggestion to report it by calling the Utah Turn-in-a-Poacher Hotline at 1-800-662-3337 or by sending an email to turninapoacher@utah.gov. 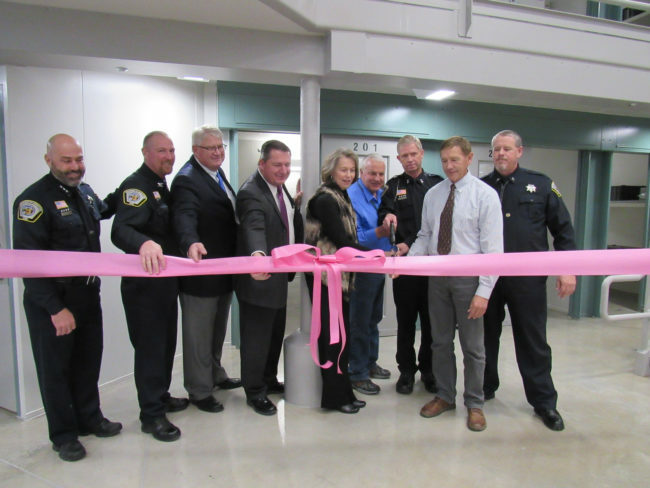 GUNNISON—A $31-million housing unit, looking as shiny as a new pair of shoes, was debuted last Thursday, Dec. 8 at the Central Utah Correctional Facility (CUCF). Following speeches commending CUCF project managers, architects, contractors, staff from the Utah Division of Facilities Construction and Maintenance (DFCM) and others who played key roles, a lineup of officials cut the ribbon on what will be known as the Ironwood housing complex. The new unit can house up to 192 inmates, which brings the total capacity of CUCF to 1,788 inmates. Seventy-six employees have been or will be hired to staff the unit. Rather than stereotypical long hallways with bars across cells, the facility is organized into three-sided “pods.” Each pod contains 32-64 cells. From the outside, the cells could be mistaken for college dorm rooms. But each has a sliding exterior door that can be electronically closed and locked from a control station outside the pod. On the main level of the pod, at the head of the pod, is the direct-supervision station. Rather than the stereotype of corrections officers walking along and patrolling rows of cells, a single direct-supervision officer staffs the station. The same officer staffs the station on a daily basis. The officer knows the inmates, and they know their officer. “By placing the officer in the pod, he or she has immediate visual observation of inmates, which allows the officer to deal with problems before they get out of hand, which enhances the safety and security of the facility,” said Steven Turley, director of the Division of Special Projects for the Utah Department of Corrections (DOC). Besides CUFC and DOC management and staff, the audience of about 50 at the ribbon-cutting included Sanpete county commissioners, the county sheriff, mayors of Gunnison Valley municipalities and at least one legislator. Before the ribbon was cut, Turley recognized people who played a key role in construction and setup of the new unit, including Shane Nelson, CUCF deputy warden, who oversaw the project, and Nelson’s support team of Capt. Kent Jolley, Lt. Shawn Youd and Tera Nelson. Also recognized were Bruce McDonough, vice president of Layton Construction of Salt Lake City, the general contractor; DeLoy Adams, Bill Ferrara and Brad Marshall, key project managers for Layton; and architects from the Archiplex Group of Salt Lake City, designers of the structure. Representing DOC was London Stromberg, deputy director, who reported that the governor’s budget was going to be a ‘big boost for our compensation plan” and for a DOC step program designed to offer career advancement for corrections officers. Turley said CUCF had been working 24 hours per day in recent weeks to get Ironwood ready for inmates. Greg Rosenvall (right), rural hospital improvement director with the Utah Hospital Association, looks on as Mark Dalley, Gunnison Valley Hospital administrator, speaks on behalf of the Gunnison Valley Hospital during the Rural Health Association of Utah Conference on Dec. 1 in St. George. 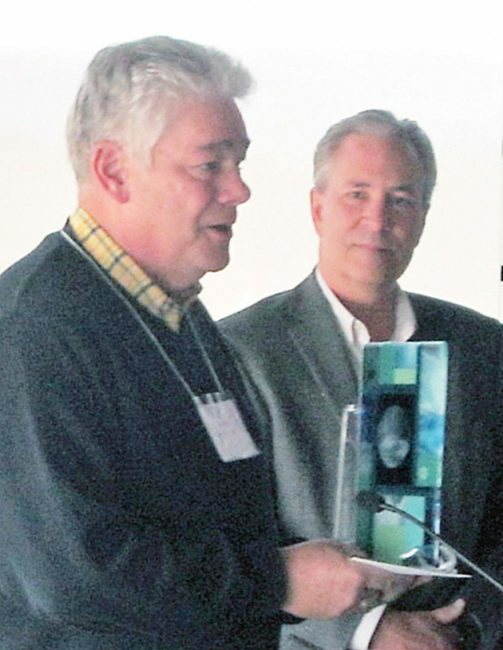 ST. GEORGE — Gunnison Valley Hospital (GVH) received the Commitment to Clinical Training Award during the Rural Health Association of Utah Conference on Dec. 1 in St. George. Greg Rosenvall, rural hospital improvement director with the Utah Hospital Association presented Mark Dalley, hospital administrator of GVH, with the award. Ganns said this award is given to a hospital or individual in the state of Utah that has shown tremendous dedication to assisting future healthcare providers in the hands-on training required of medical graduate students. During the conference, Rosenvall mentioned that Dalley goes above and beyond what is required of his role to provide needed rural clinical training for medical students. Specifically, when Dalley was approached to increase the number of graduate health students in the Gunnison area, he took the initiative to contact the physician preceptors directly and provided free housing owned by the hospital for students to occupy while completing medical rotations. This practice has allowed multiple medical students to receive training in a rural setting, which Ganns says often incentivizes these students to return to rural communities to practice in the future. Carrie Torgersen, program coordinator with the Utah Center for Rural Health, works directly with Dalley to place students in medical rotations. “Other hospital executives will hear what the Gunnison Valley Hospital is doing and be inspired to do the same thing in their communities,” said Torgersen, who places students in clinical rotations across the state. GVH is a Critical Access Hospital, which is a designation given to certain rural hospitals by the Centers for Medicare and Medicaid Services with particularity high need. Dalley, with over 35 years in the healthcare industry, has been the administrator of the Gunnison Valley Hospital for the past five years. In his career, Dalley has also worked for two large systems, Intermountain Healthcare and Catholic Health Initiatives, and for the Rural Health Management Corporation, a rural hospital management company. Dalley is currently on the board of the Utah Hospital Association and chairman of the board on the Utah Rural Independent Hospital Network. Dalley and his wife Mary Jayne are the parents of six children and proud grandparents of 13 (soon to be 14) grandchildren. Ganns said the Commitment to Clinical Training Award itself is a work of fused glass art created by local glass artist Carrie Trenholm. Information on Trenholm’s art can be found online at www.trenholmglass.com. After many years of no dramatic improvement to Main Street, I want to express my appreciation for the efforts made by our city and Cache Valley Bank to beautify the central part of it and efforts by other businesses elsewhere on Main Street. I think it’s a big step in the right direction. Likewise, the city’s commitment to ridding Main Street of blights is, I think, commendable. Individual citizens are also to be commended, in my opinion, for their personal contributions to the “restoration” of our community. I am encouraged when I see an old neglected, often dilapidated, house being sensitively restored to a strikingly beautiful appearance. Whenever this is done, the entire block benefits, as well as our city as a whole. I am concerned, however, about the two Victorian houses immediately north of the Sinclair station. I seem to remember Brant Hansen being reported in the newspaper as saying something about an option the city has where they could purchase the houses and offer them for sale (my own words follow) under a covenant whereby the buyer must restore or preserve the exterior’s original appearance. The buyer would not be compelled but encouraged to retain original architectural features on the interior. I think it would be a sad thing to lose these two houses that reflect the architectural history of Ephraim. In my mind, they could be real assets to our Main Street which, after all, is the Heritage Highway. All over town we can still see examples of pioneer-built homes (1860-1890) and some that were built somewhere later, all of which serve to inform us of life and ideals of a very different time and how things change over times. This enriches our lives, broadens our perceptions and perspective, and can actually inspire some people to take positive action toward preserving and enhancing what we are privileged to have. I am a committed preservationist and an unabashed lover of old houses, as most people know and sometimes seem to resent. I try always to encourage people to research, appreciate, and preserve or restore their historical houses, stores, etc. Sometimes I’ve been critical, and I apologize. With all my faults, I do practice what I preach about honoring our architectural heritage. If I have inspired only one individual—and I think I have done at least that—then it is worth the effort and any criticism it might generate. Does preservation matter? I would say, absolutely! Calder Bret Blackburn was born to Brayden and Kensey Blackburn of Mayfield on Dec. 4, 2016. He weighed four pounds 12 ounces. Norman and Eliza Jensen of Centerfield are pleased to announce the marriage of their daughter, Megan Jensen to David Hutchinson, the son of Kevin Hutchinson and Jan Rescia of New Hampshire in the Payson, Utah Temple Dec. 17, 2016. Megan is a graduate of Gunnison Valley High School. She earned a bachelor’s degree at Southern Utah University and served an LDS Mission to Manchester, New Hampshire. 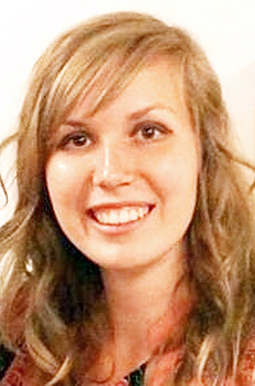 Megan is pursuing a master’s degree in mass communication from Southern Utah University. Her grandparents are Eugene and Nancy Jensen of Centerfield and the late U’Dell and Lou Gene Johnson and Jean Johnson of Redmond. David is from Canterbury, New Hampshire where he graduated from Belmont High School. He has studied at New Hampshire Institute of Art and served an LDS Mission to Los Angeles. David plans to attend Southern Utah University in counseling. His grandparents are Mr. and Mrs. Deloss Eggleston from Ogden, Utah and Ken Hutchinson from New Hampshire. David and Megan will make their home in Cedar City while they attend SUU. We invite everyone to celebrate with us Friday, Dec. 16 at the Centerfield Church from 6:30 to 8 p.m.
Bruce and Laurie Miller of Manti, are pleased to announce the marriage of their daughter Tia Merissa, to Rogelio Stefano Bonilla, son of Jose’ Luis and Hilda Bonilla of Mexico City, Mexico and El Paso, Texas. The couple will be sealed for time and all eternity in the Provo City Center Temple on Tuesday, Dec. 20, 2016. Tia is a graduate of Manti High School and Seminary. 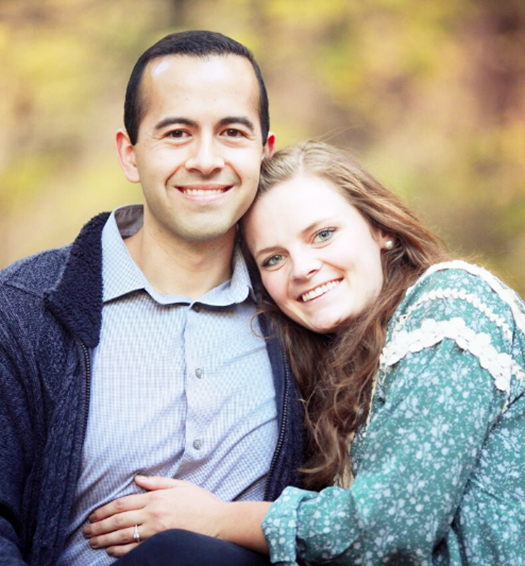 She attended one year of BYU where she briefly met Rogelio, then she served a full time LDS Mission in the Tennessee Nashville Mission. Upon returning from her mission she began working at the Provo City Center Temple. She also started to attend an LDS Institute class, her friend Rogelio happened to be taking the same class. Rogelio graduated from High School in El Paso, Texas and Seminary in El Benemérito de las Americas. He served a full time LDS Mission in Wisconsin working with the Hmong people. He graduated from BYU in linguistics and currently speaks six languages. He is currently employed with Domo in Utah County using his language and computer skills. No formal reception will be held. 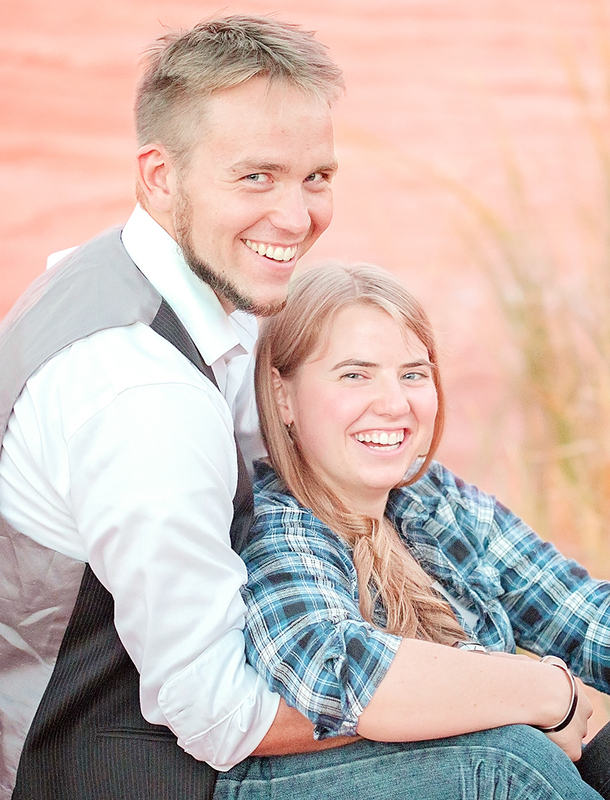 The couple will live in Provo after a honeymoon to Portugal, where they will continue to work and attend BYU. Kelsi Conrad has returned from the Florida, Tampa Mission where she served 18 months as a missionary for The Church of Jesus Christ of Latter-day Saints. She will give her homecoming report on Jan 1, 2017 at 9 a.m. at the Red Brick Church Building, located at 295 South Main in Manti. Kelsi is the daughter of Dave and Mary Conrad. David Bruce Nell, 71 years old, passed away peacefully in his home surrounded by loved ones on Dec. 10, 2016. He was born in Manti, Utah on Aug. 30, 1945 to Arthur H. Nell and Lorna Voorhees Nell. Bruce was raised in Manti, Utah. 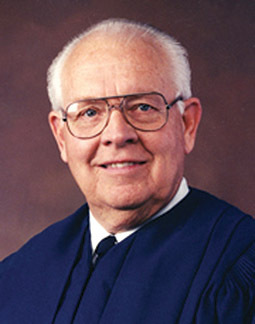 He graduated from Manti High School in 1963 and attended Snow College. Bruce married the love of his life Karen Fugate Nell on June 12, 1971 in Spanish Fork, Utah. 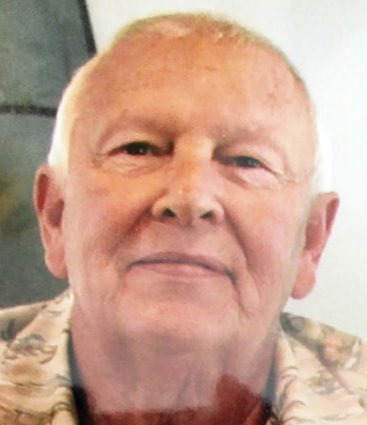 Bruce was a successful owner and businessman of Nell’s Motor in Manti, Utah from 1971-2006. They moved to Washington, Utah where Bruce worked for Interstate Tire Distributors from 2006-2013. He enjoyed spending time with his children and grandchildren but most of all his best friend, his wife Karen. Early in his marriage he loved spending time at the lake with his blue Nordic boat and his family. He loved to waterski. When he was not on the lake he would take to the hills to hunt arrowheads. Bruce/ Macgyver could fix anything. He was a talented mechanic. Bruce was known throughout his neighborhood as the guy who can fix it and would help anyone. He loved people and the outdoors. He passed his love of boating and the outdoors to his family. In his recent years, Bruce enjoyed lapidary and silversmith work where his pieces are displayed and sold in multiple Utah galleries. Bruce was diagnosed with prostate cancer in 2011. He sought various treatments and had excellent caregivers. The family wants to acknowledge all the caregivers including Encompass Home Health and Hospice. After fighting a six-year battle he now has peace. Bruce is survived by his wife Karen Fugate Nell, Washington, Utah. His children Natali (Jake) Schoppe, Panguitch, Utah, Dustin (Jana) Nell, Saratoga Springs, Utah, Shana Nell, Salt Lake City, Utah, His grandchildren, Jonah and Porter Schoppe, Austen and Payten Nell, Isaac Walk. He is preceded in death by his parents: Art and Lorna Nell and his brother Glade Nell. A celebration of Bruce’s life will be held Saturday, Jan. 7, 2017 at Spilsbury Mortuary located at 110 South Bluff Street, St. George, Utah. Visitation will start at 10:30 a.m. with services following at noon. Arrangements are made under the direction of Spilsbury Mortuary. 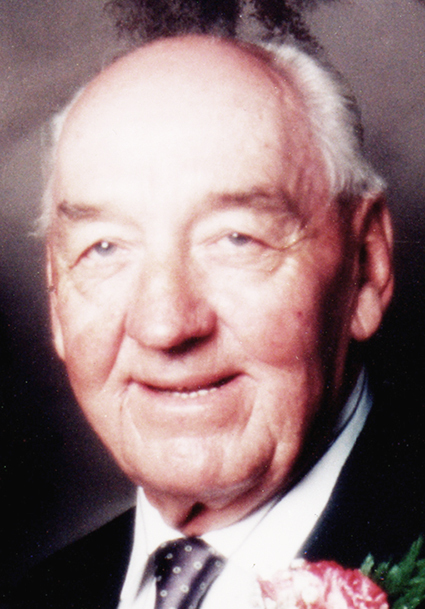 Glen Dale Jorgenson, 91, passed away on Dec. 11, 2016, surrounded by his loving family. He was born on March 17, 1925, in Ephraim, Utah, to Enoch and Elvira Nielsen Jorgenson and was the fifth of seven children. After graduating from Ephraim High School, he joined the US Army where he served as a staff sergeant during World War II in the Black Panther Division of the 66th Infantry. When he returned home, he married Ruth Marie Hermansen in the Manti Temple on Sept. 19, 1947. They are the parents of six children. He attended Snow College, the University of Utah, and graduated in dentistry from Northwestern University in Chicago, Illinois. He worked as a dentist for 52 years and retired at the age of 78. His patients were some of his best friends, and he took pride in doing the best work he could for them. He loved his family and taught them how to work hard and to be dependable and honest. He enjoyed riding and caring for his horses, fishing, farming, gardening, planting and grafting apple trees, flying airplanes, being in the mountains and taking trips with his family. In his later years, he loved to sing. 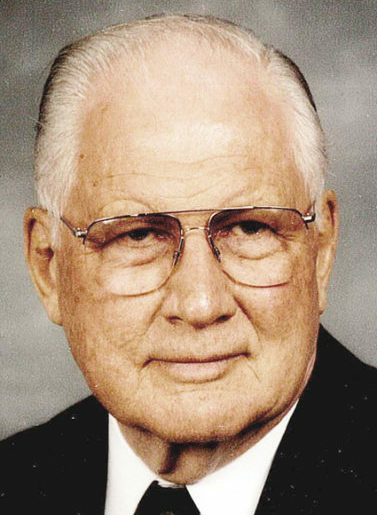 He was a faithful and devoted member of The Church of Jesus Christ of Latter-day Saints. He served as a home teacher, bishop, high councilman and in many other callings. He was a man of integrity, always wanting to do what was right. He is preceded in death by his wife, parents, brothers and sisters, two grandsons and three great-granddaughters. He is survived by his children Jane (Fred) Carpenter of Parowan, Utah, Byron (Marie) Jorgenson of Sandy, Utah, Franklin (Patricia) Jorgenson of Bountiful, Utah, Nancy (David) Taylor of Lehi, Utah, Tyson Behunin of Bountiful, Utah, Brent Jorgenson of Murray, Utah, 21 grandchildren and 47great-grandchildren. Funeral services will be held Friday, Dec. 16, at 10:30 a.m. at the Lehi 4th Ward building, 851 North 1200 East, Lehi, with a viewing prior to the service from 9 to 10:15 a.m. A graveside service will be held at the Ephraim City Cemetery in Ephraim, Utah, at 3 p.m.
Funeral Directors: Utah Valley Mortuary. Condolences may be expressed to the family at www.uvfuneral.com. On the morning of Dec. 10, 2016 there was a glorious reunion with many loved ones as Cecil J. Cox left this mortal earth to join numerous loved ones. Cecil J. Cox was born in Feb. 15, 1923 in Manti Utah to Jay and Hazel (Jacobson) Cox. He passed from this life on Dec. 10, 2016 in St George Utah at the age of 93. Cecil attended schools in Manti and graduated from Manti High School. Cecil married his sweetheart Phyllis Lorraine (Olsen) Cox shortly after high school on Aug. 15, 1942. He served in the Navy during World War II shortly after this marriage leaving behind his wife and young son. While he served in World War II, his three other brothers were also enlisted and serving in the war at the same time in different military branches. Their parents watched while all four of their sons served for the United States of America. What a sacrifice for these parents that must have been. When he returned home, Cecil started Cox Brothers Construction Company with his brother Max, and they operated this business from 1946 to 1974. This construction company grew rapidly through the years and was one of the fourth largest construction companies in the state. The Cox Construction Company was well known in the Western States and the construction industry. Cox Construction Company helped to develop many of the new types of roads, bridges and interstates during that time in the state of Utah. Cecil also owned and operated several other successful companies during his life time, and was a very successful business professional. After their marriage in 1942, Cecil and Phyllis were blessed with five children who they enjoyed watching grow and develop and teaching them many valuable life lessons along the way, and a true ethic of hard work. These children are Ronnie Jay (Tami), Brent Cecil (LaDonna), Joy Ellen (Gary) Young, Larry William (Betty Jean) and Michael Gordan (Darla). This marriage union was later sealed on Dec. 18, 1963, the very same date that his oldest son and his wife were also sealed in the Manti Temple. This was a glorious day for the family, to be sealed together on the same day. They have been blessed with many grandchildren, great-grandchildren, and a great-great- grandchild, and each was a welcomed child into this family that they were very proud of and loved dearly. Cecil and Phyllis enjoyed being active members of the Met & ET Club in Manti, with their many close friends. They enjoyed this association and remained dear friends with all of them through their lifetimes. Cecil was active in the LDS Church and served as a home teacher and attended the temple often during his retirement. During Cecil’s retirement he enjoyed golfing and helped with the success of the Palisade Golf Course in Sanpete County. He also helped establish the driving range at the South Gate Golf Course in St. George, Utah. He was an avid golf player and was well known for his abilities, skills. He won many golf tournaments, and especially his “Six Hole-in-One” accomplishments. Cecil was the youngest boy of seven children, as he had three sisters and three brothers. He is survived by his youngest sister, Phyllis Cox Irons of Moroni, who just recently turned 90, all of his children and their spouses, grandchildren, great-grandchildren, and a great-great-grandchild. The family would like to thank the Beehive Assisted Living His precious wife Phyllis Lorraine Cox preceded him in death on Dec. 4, 1994. There is now a beautiful reunion this special holiday season as they can once again be together. Preceded in his death were: sisters Beulah Tuttle, Naomi Cox, and brothers Elliott, Homer (Junior) and Max Cox. He was also preceded by his parents Jay and Hazel (Jacobson) Cox, and three great-grandchildren, Tyson Miller, Jared Miller and Jessica Jean Miller. Center in St. George and the staff there. They became such a valuable part of his extended family for so many years. They helped to make his life more enjoyable while he was there and to help him find enjoyment in his life. He was a model resident for them. During the last months of his life the Applegate Hospice Care, including Bob, Craig and Colten, were instrumental in helping ease his pain, and to care for him in such a loving, helpful and tender way until the end. The family deeply appreciates them for their acts of kindness and love. There have also been many family and friends who have made visits and helped with his care and his enjoyment, and the family appreciates these many acts of time and kindness. Funeral services will be held on Friday, Dec. 16, 2016 at noon in the Manti Tabernacle. Friends may call on Thursday, Dec. 15, 2016 at the Tabernacle from 6-7:30 p.m. and also prior to services on Friday from 10-11:30 a.m. Burial will be in the Manti City Cemetery with Military Honors by the Manti American Legion Post #31. Funeral Directors: Magleby Mortuary, Richfield, Salina and Manti. Online guestbook at maglebymortuary.com. Our spunky, fun-loving, courageous, and generous mother and grandmother, Lavonda Harper Hanson, Mt. Pleasant, Utah, was reunited with her eternal companion on Monday, Dec. 5, 2016. Lavonda was born Nov. 20, 1932 to Richard Golden and Ruby Nelda Harper in Sublett, Idaho and was the fourth of 10 children. The family later moved to nearby Oakley, Idaho where she spent her summers picking potatoes, thinning sugar beets, and where she fostered her lifelong work ethic. Lavonda met Harry L. Hanson, the love of her life, in Burley, Idaho when Mom was working for an accountant. They were married in her parent’s home on June 9, 1956. They began their married life in Burley, and later moved to Ely, Nevada and then to Mt. Pleasant when Harry was transferred. When JC Penney closed in 1972, Harry and Lavonda started their own department store, Big V. Mom spent many hours keeping the books and helping in the store. She also worked as the secretary of the North Sanpete High School. They also owned a variety store in Mt. Pleasant, and a convenience store, campground, and car wash in Green River, Utah. Mom was an excellent cook and her passion was spoiling her family. Holidays were a very big deal! Mom loved hosting annual family trips to Lake Powell, Lagoon, and BYU bowl games. Mom never missed a family event, no matter how far away it was. Mom was a faithful member of The Church of Jesus Christ of Latter-day Saints and possessed a firm testimony of her Savior. She served faithfully in many positions. Her favorites were working with the young women in sports and going to girl’s camp. In their retirement years, Lavonda and Harry enjoyed serving in the Manti Temple. Lavonda is survived by her children; Kathy (Clark) Knudsen, Lehi; Larry (Camille) Hanson, Stansbury Park; and Nancy (Tony) Johnson, Salt Lake City; eight grandchildren: Landon Smith, Ryan Banasky, Torrie Smith Kidd, Brittany Johnson Snow, Jordan Smith, Calli Johnson Dressen, Brooklyn Banasky Jackman and Andrew Hanson and eight great-grandchildren, with one on the way. Lavonda was welcomed home by her parents, her husband, daughter Pamela Banasky, and grandchildren, Jessica and Justin Smith. Funeral services were held Friday, Dec. 9, 2016 at noon in the Larkin Sunset Gardens Mortuary, 1950 E Dimple Dell Road (10600 S) in Sandy, Utah. Viewing was at the same mortuary beginning at 10:30-11:45 a.m. Interment followed at Larkin Sunset Garden Cemetery, right next to the mortuary. Special thanks to Carrington Court Memory Care and Millcreek Hospice for their wonderful care and compassion. Thanks also to mom’s many friends and relatives for their calls, visits, notes, and kind words of support. To honor Lavonda’s memory, feel free to donate to the Alzheimer’s foundation or do something kind to help someone in need. Grandma Vonda, you will be forever in our hearts!